Sand Dollar Printed V-Neck Tee in flattering Rib Knit 100% Cotton. ICanToo - 100% Cotton V-Neck Sand Dollar Print Tee. Cotton Blouse Tee Shirt. Breezy Rib Knit Tees in delightful summer colors with scattered sand dollars made here in the USA in cool and comfortable 100% Cotton will bring the joy of the seaside to you. The soft, finely ribbed cotton gently follows your shape without clinging. Standard Women's sizes in S, M, L, XL, 2XL. Be sure to see details in Size Chart. Made in USA. 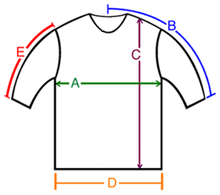 A: Chest / Bust circumference 33-34" 35-36" 37-38" 40-41" 41-42"
B: Sleeve length from center of neck to end of sleeve 14" 14.5" 15.5" 15.5" 16"
C: Body length from shoulder to bottom of hem 23" 24" 24" 25" 25.5"
D: Hem circumference 36" 38" 42" 43" 45"
E: Sleeve length from shoulder to end of sleeve 6.5" 7" 7.5" 8" 8"
more, but don't look good in the only alternative --- kiwi. This is a nice weight that doesn't show the lumps and bumps.